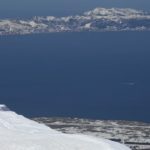 Come on this 3-day guided backcountry snowboarding adventure in Rishiri with the only local JMGA certified mountain guide in this Japanese island, Toshiya! Born and rase in Rishiri, it will be my pleasure to show you this remote and exotic island located in the north of Japan! With a circumference of only 60 kilometers, Rishiri Island is located about 20 kilometers off the northwest coast of Hokkaido. Since there are no lifts but the snow here is legendary, Rishiri is the perfect destination for backcountry snowboarding. Mount Rishiri (1721 m) stands in the centre of this small and circular island. This dormant volcano is also known as Rishiri-Fuji due to its resemblance with the most famous peak in Japan. 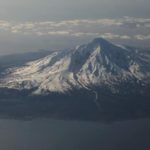 While exploring this amazing volcano and several other peaks, we will use snowmobiles to cover the long and flat distances and skins when we’ll need to go up. During this 3-day guided adventure, we will go where snow and weather conditions are best but most importantly, I will organize this program depending on the participants wishes and level experience. As there will be 2 guides, we will divide into two groups (either by level or by friend groups). Regarding our accommodation, participants are welcome to stay at my own hostel. A cozy and peaceful place where you will be able to relax in the hot spring baths called onsens while enjoying some delicious homemade Japanese food. A great opportunity to explore the Japanese culture and its traditions! Keep in mind there are no rental shops on the island so please take all your equipment with you, including your avalanche beacon, shovel, probe, your crampons and ice axe. Suitable for intermediate skiers and snowboarders, if you are tempted by this adventure, request to book this trip and join me on this unique Japanese experience! The price will depend on the number of people joining (whether you came as a group or you are joining an existing one). Please note that for this 3-day trip, 4 nights of accommodation are included (with breakfast and dinner). Bath Tax is included in the price. You will stay in my family hostel (winter price). You will have to arrive on Rishiri island the night before and it is recommended to leave the day after the tour. As we will be 2 guides running the program, we will split the group by friends or by level. Price: the price at the time of booking depends on the group size at that time. If the group size changes on the actual day, then the difference will be refunded (if more clients) or will have to be covered by the clients (if fewer clients). I can help you with the transportation from the ferry terminal or the airport to the lodge. Participants will be able to come by plane which will only take 45 minutes coming from Sapporo or by ferry (1:40 hr) in case you are coming from Wakkanai. - Please be aware that depending on the weather and the conditions, I may decide to change the route, objective of the tour, and any other contents of the trip, for safety reasons. - As a guide, I cannot be held liable for any accidents that may occur during the trip, except for those that occur due to my gross negligence or malicious intent. - Please also be aware that I will be guiding at a pace appropriate for the participant with the least technical and fitness levels. I was born on the island of Rishiri in 1969. I still live here today! Since my childhood, I have spent most of my time in the sea, going fishing, and in the mountain going skiing. I’m a ski guide (level 2) from the Japanese Mountain Guide Association. I’m the only one on the island. I have reached the summit of Rishiri more than 500 times… It’s my great pleasure to guide here and let people from all around the world discover this beautiful island all year round. Please feel free to get in touch with me if you are looking for a local expert to guide you in Rishiri. Besides mountain guiding, I'm managing a family hostel here so I can help you with the accommodation as well. similar abilities and objectives. If you end up in a mixed group they do their best, but they have to slow the pace to the least experienced people in the group. The accommodations at the pension were very comfortable and the staff was excellent as well. Food was fantastic, including several unique and authentic Japanese dishes. with snow mobiles for initial access and a large variety of steeper terrain for skinning up and skiing down. Can suit a range of wind directions and conditions. The accommodation is new and comfortable and the Japanese dinners and breakfasts are great if you like seafood. There is also an onsen there. Unfortunately we were there at a time when there was no new snow however this was compensated for with the magnificent views we had if Rishiri mountain and surrounding islands. English very limited. But otherwise the experience, the accommodation, the snow, the place and the guide were truly amazing! and the rest of the world. 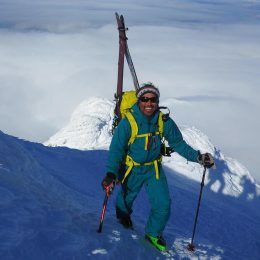 Toshi is an exceptional guide, is an expert on the islands skiing and has a fantastic set up including accomodation. His pension is perfect for daily excursions into the backcountry. I cannot recommend this trip enough except that I don’t want eveyone else to know about this very special place. knowledge and passion. We did learn a lot about the flora on Japan’s most Northern islands! Rishiri-Zan was a great, pleasant summer hike and must be beautiful and fun for ski touring in Winter time. thanks again! will share his passion with a legendary smile? Check! Toshiya and his family are the additional element that make this kind of trip just epic. are 5 guides apparently). He is great, he and his sister run a ryokan (hotel) which is nice, great food and with a nice onzen (natural hot spring) to relax after skiing (they can open a big door so you can see the mountain and the stars whilst enjoying the bath. Bit hard to get to Rishiri but the powder on the big mountain pays for everything, truly amazing. Toshiya climbed the top over 500 times so he knows the mountain and the good spots to find the best conditions depending on wind etc. According to him the best season is February/early March. The wind is the main factor whether or not to reach the top and that is the same most months however powder is best not too late in the season (we were in early March). Temperature is not too bad despite being very close to Siberia. I may go again next year! Off-piste Snowboarding - 1+ day - Interm.